Chances are, the lives of those you know and love have been positively impacted by the work of USP’s staff and scientists, volunteer experts and collaborating stakeholders. In my six months since joining USP as CEO, I have been impressed and inspired by the energy and knowledge of the people who move USP forward and I am excited about what the future holds. USP is committed to the quality of medicines and food. Protecting and improving the quality of these items is a key element in improving public health and our standards for identity, strength, quality and purity are benchmarks referenced around the world. We have a unique voice: Our expertise, our commitment, our history, the depth and scope of our work, the science-based nature of our standard-setting activities, our international presence and our position as a non-profit non-governmental organization makes us quite unique. Our science-based standards are generated in a time-enduring manner, developed and reviewed in a public setting and approved by committees comprised of globally recognized experts who volunteer their time and services. We have a long history of focusing on quality. In fact, we predate the US FDA by nearly 100 years and are only 44 years younger than the U.S. as a country. USP compendial standards for drugs are recognized under US law and are enforceable by the FDA. Our standards for other items, such as food ingredients, dietary supplements and herbal products, are voluntary. We encourage the adoption or adaptation of USP standards because we all depend upon products that are the end-result of good global supply and manufacturing chain practices that emphasize quality. USP began with an idea, sparked in 1820 by a group of eleven physicians, who believed there should be a process for developing clear quality standards for the medicines used in the U.S. That work continues today, not just for medicines, but for other products we consume: food ingredients, dietary supplements whose raw materials and finished products circle the world before they end up in the hands of doctors, pharmacists and our families. The quality of the science behind the standards. All of these factors impact the final products – and the health and safety of the consumers using these products – and requires the involvement of industry, governments and regulators, public health organizations, consumers and other concerned parties. 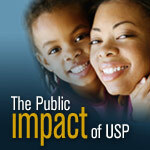 USP also impacts a growing list of other health-related issues – from training and providing assistance to agencies in Africa and Southeast Asia, working to curb the flow of life-threatening substandard or counterfeit drugs, to crafting guidelines for warning labels on medicines, exploring ways to reduce medical errors or developing standards for veterinary products. We look forward to continuing a dialog about the importance and impact of quality and encourage you to join the process. If you have a background as a scientist, academician, regulatory professional, healthcare practitioner, or are involved in other work with medicines and foods—you have a unique opportunity to participate as a USP expert volunteer. Additionally, we hope you explore the USP Quality Matters blog and our website for regular updates about our work. Together, our scientists and staff, expert volunteers and partners around the world remain committed to the vision of improving public health by promoting quality standards.